"This is not the outcome we wanted or we worked so hard for, and I am sorry we did not win this election for the values we share and the vision we hold for our country. I have had successes and have had setbacks. Many of you are at the beginning of your professional public and political careers. You will have successes and setbacks too" - Hillary Clinton. The above is from Clinton's recent election loss concession speech. Does not the speech a reminder of shakespeare's words about some people born great, about some who have greatness thrust upon them and others who achieve greatness? Isn't Clinton and Shakespeare similar in their words, though written differently? Clinton has tried to achieve the unusual in the United States, but in some other climes around the world, some other women have shattered the same glass ceiling, which Americans have twice resisted. Recently in Britain, Theresa May got elevated to the post of prime minister of her country without so much effort on her part. Angela Merkel is in control in Germany. Ellen Johnson Sirleaf is in control in Liberia. Johanna Sigurdardottir is in control in Iceland. Helle Thorning-Schmidt is in control in Denmark. Julia Gillard is the prime minister of Australia.Yingluck Shinawatra is calling the shots in Thailand. Cristina fernandez is in the president of Argentina. Sheik Hasina Wajed is in Bangladesh. Laura chinchilla is the president of Costa Rica. Tarja halonen is the president of Finland.Dalia Grybauskaite is the president of Lithuania and Kamla Persad-Bissessar is the prime minister of Trinidad and Tobago. Dilma Rousseff was leader in Brazil before her unfortunate loss of power. And before the current women leaders around the world, the world had Indira Ghandi. And the world cannot quickly forget the iron Lady Margaret Thatcher in the United kingdom. 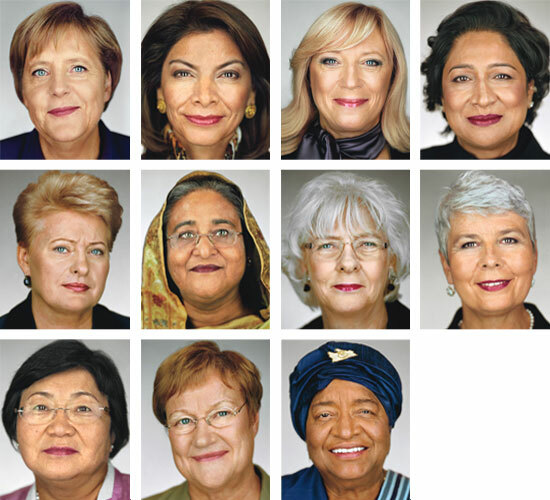 These women represent different cracks on the glass ceiling around the world. e state houses all over the world. Aside from women who have been leaders on their own, there women who are in the state houses all over the world alongside their husbands, just as Mrs. Clinton too was a former first lady in the US. Is it a case of destiny that some women may have been born to be leaders and others to be First Ladies? Is it about destiny that cannot be changed? Mrs. Clinton said it is not about her, but about the values they both share and that her own failure should not stop the young women from having aspiration to lead. She says she believes in america and that she will always will and charged her supporters that if they believe in America the same she does, they must accept the election result and then look to the future. This a bold statement about humans' journey on earth with some who are hopeful and others practical behavior on the street as protesters signifying hopelessness. Who knows whether it is the destiny of the election winner to be president or his wife to be First Lady and that the destiny of Clinton is just to be First Lady, Senator and Secretary of State?